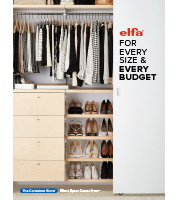 For those narrow and tall pantry spaces, look no further than our White Elfa Reach-In Pantry. Available only at The Container Store, this solution features Elfa Ventilated Shelves that make room for every kitchen staple, bin and appliance. All Elfa components are adjustable, so each solution is completely flexible! This solution is designed for a space at least 21" wide. If this won't work for you, please contact us so we can design the perfect solution for you with our free service! How does this fit in a 20&rdquo;-wide space when the top bar is 32&rdquo;? Thank you! elfa Top Tracks can be cut to the appropriate length for smaller spaces. How much weight would each shelf of this width hold? I am looking for a solution for some heavier items (big mixer, etc.). When installed properly (into studs where possible and using our wall anchors where studs aren't present), our Elfa solutions can support up to 75 lbs. per linear foot. How much weight does each shelf hold?